Our last company visit was to JR, a railway station company. It is actually the most successful railway station in Japan, with an average revenue of 25 billion USD per year. The company has many new concepts they are developing, many of which fascinate me. The new Shinkansen railway train in development now is called the Hayabusa, and it will be the fastest train in Japan, traveling at 320 km/hr (200 mph)! Also, the company is working to develop new ecological trains and devices including a diesel hybrid railcar, a battery rechargeable railcar, a power-generating floor (walking on it creates and stores power), and tissue made out of old rail pass tickets! Unfortunately, suicide can be a problem in metro stations, as an average of one person per day attempts suicide by jumping in front of a moving train. JR has plans to reduce this occurrence using LED lights, mirrors, special cameras, and barriers. In addition, if such an unfortunate event is to happen, JR plans to inform waiting riders of the train’s location, arrival time, and any mishaps using improved digital monitors at several places in each station. Right now, digital screens display this information with words and numbers only, but new screens will provide easy to understand images primarily for the purpose of displaying the location of the train and allowing people of all languages to understand. One of the most interesting new developments JR showed to us is their printable route kiosk, which allows the user to type in their starting and ending location, resulting in the kiosk displaying several different routes. The quickest, cheapest, least transfers, and earliest routes are all highlighted. Once the user selects a route, they can print it out for personal use. In fact, the demo machine allowed me to do so, and I happened to use it for my trip to the airport! Unlike Keio University, we got to revisit Waseda University the next day for a second session. This time, we talked to students in an English class with a Japanese professor, and the class was only a beginner class for English. Because of this, we had to take advantage of other ways to communicate, rather than using just words. For example, I would use hand gestures to describe nouns and/or action verbs. Other times I would point at objects or even draw images. This shows that imagery is a true universal language understood by all, except the visually impaired. The ability of Japanese residents to learn English makes me want to learn a language as well, in order to be respectful to the diversity of the world. English seems to be the language of the world in many cases, but to go to a foreign country and expect them to know English in my opinion is disrespectful. At times in my travel through Japan, I wished there was less English present, so that I had more motivation to integrate myself and to learn more of the language. 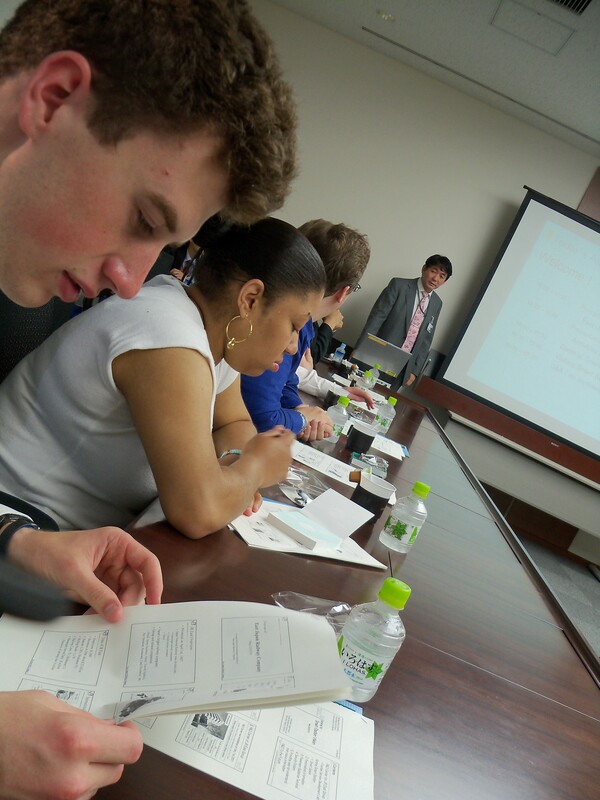 Of the two university visits, the first one we made was to Keio University. 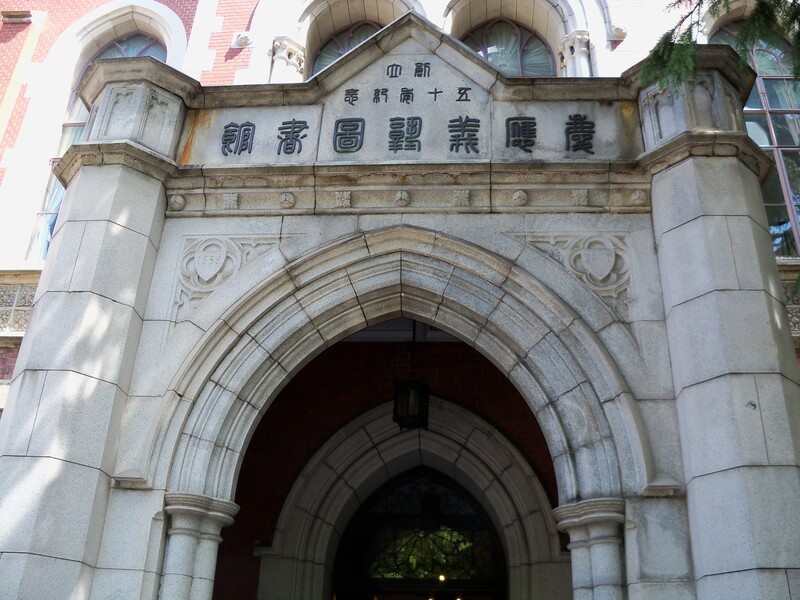 This university is located in Tokyo and is one of the oldest universities in the area. Like many large universities in America, Keio University has multiple campuses as well. During our visit to the university, our group was able to meet and interact with students. Their level of fluency in the English language varied greatly, but the students with the best knowledge of the language often translated for their fellow students, to aid the communication barrier. One of the students gave a presentation on Twitter and its rise in popularity in recent years. It was here I learned that some students have Twitter, making it only slightly more popular in Japan than America, and almost zero students had a Facebook! Apparently MIXI is the Japanese version of Facebook, which is why students see no need to obtain a Facebook. I also found it very interesting that the prime minister of Japan had a Twitter, which had actually raised some controversy in Japan. Dr. C administered a survey for the students to fill out, and to do so, he used the QR codes I mentioned in my last post! Unfortunately, there was an error with the links in the QR codes, and he wasn’t able to use them as planned. But I still found it fascinating that he could rely on every student to have a cell phone capable of doing this! Keio University student showing Dr. C her cell phone. Cell phones in Japan are unique in the sense that they are all mostly uniform. Most of the cell phones used are long, rectangular flip phones. Even though several different companies makes cell phones, they all take the same general shape, with small variations here and there, so to make each one unique. iPhones are the only type of cell phone I’ve noticed to be popular that does not fit this format, most likely because the iPhone is an international phone. In Japan, residents use their phones for SMS, e-mail, games, video, and web more than residents in the U.S. One popular example of this would be Japanese use of QR codes. QR Code (in the speech bubble) advertising a ride at Fiji-Q Highland. 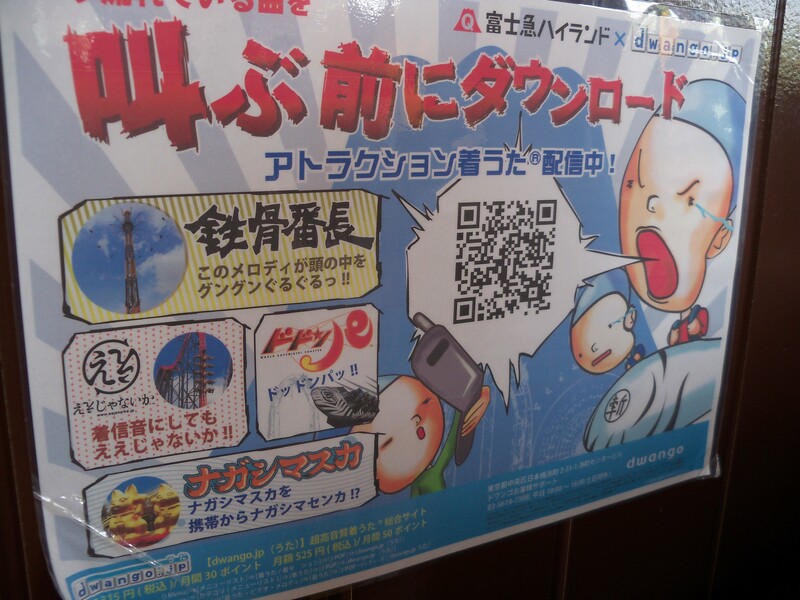 Just about everywhere we went in Japan, there were QR codes. People with Japanese cell phones can access websites via the camera in their phone, using the Quick Response codes. Also, Japanese use mobile games more often than Americans, make it a great market for simple mobile games. In Japan, I have had to alter some of my actions and behaviors based on the country’s norms. Even though everyone in Japan was extremely kind and friendly, I still wanted to respect their way of life. In the subway, it is expected of all passengers to keep their phones on silent and converse quietly. A few people in our group had to get used to this as many Americans can talk as loudly as they wish in public. Many bathrooms in hotels and restaurants are western-style (similar to America), but in the subway and a few shops I cam across, the bathrooms didn’t have toilets so much as they had holes in the ground. Some of the toilets had flushes and toilet paper still, but not all of them did! People in these stalls are expected to squat over the opening and relieve themselves, just like what one must do in the wilderness. Needless to say, I did not like these toilets and avoided them as much as possible. Paying for things was another thing I wasn’t used to. Just about all places, I was supposed to set my money in a tray rather than handing it directly to the cashier. In many cases, I would hand the money to the cashier and they would place it in the tray first anyway. Regardless, I always made sure to bow to everyone to show respect, even if I didn’t thank them verbally. People bowed to each other always to express gratitude, thanks, and respect. I very much liked this routin because it was easy for me to show my thanks without using the language poorly.